Bursting with flavors from juicy blueberries and cinnamon and loaded with zucchini too these moist and scrumptious muffins are perfectly wholesome and great as snack or breakfast for the whole family! Blueberries and Zucchinis are in season right now!! Yay! What do you do with all that blueberries and zucchinis on your fridge? Make some delicious muffins! That’s exactly what I did and my family are happy made these scrumptious muffins. I have previously made blueberry muffins and for countless times baked some zucchini bread especially as the latter is my hubby’s favorite. However, I have never combined both in muffin form. 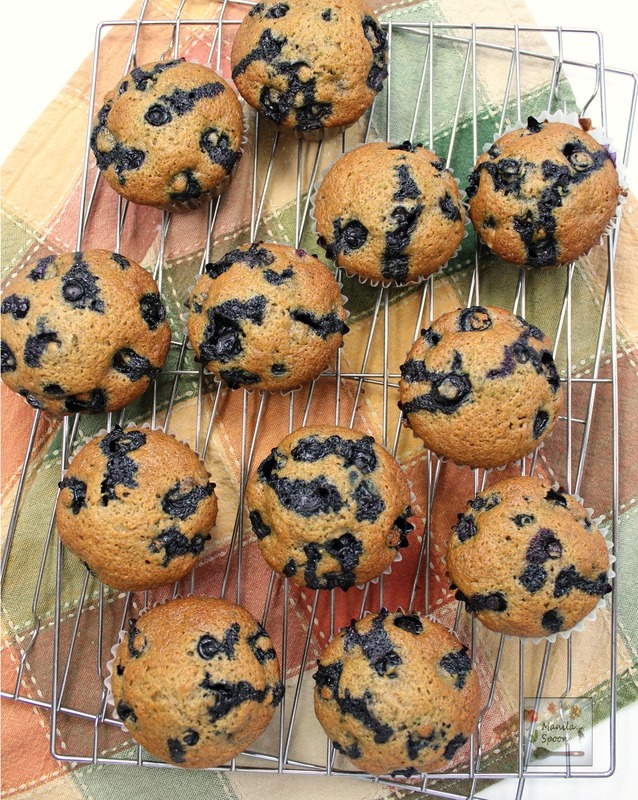 Thankfully, we had extra blueberries this week and when I decided to make muffins again – I remembered my quick bread version with blueberries with zucchini. I made that bread many years ago when we were still living in Michigan and after we went blueberry picking. I thought it’s time to adapt that recipe for making muffins. I was also a little pressed for time and couldn’t wait for a longer baking time and making muffins made more sense especially when you have a kid impatiently waiting for her afternoon snack! Mommy had to hurry. I am glad the muffins came out moist and very tasty. I added a little bit of spice for extra flavor – just a tad of cinnamon and nutmeg and I think that really made a difference. Then my hubby, who was captivated by the delicious aroma from the muffins as they baked, had a yummy idea to spread some mascarpone cheese on the still warm muffins!! Wow!! That was amazing. I would certainly recommend that! If you don’t have mascarpone, softened cream cheese should work nicely, too. I am glad everyone enjoyed their mid-afternoon snack and hope you all try these wholesome muffins too! Bursting with flavor from juicy blueberries and loaded with zucchini too these moist and scrumptious muffins are perfectly wholesome and great as snack or breakfast for the whole family! Preheat oven to 400 F/ 200 C. Line a 12-cup muffin tin with muffin cups. In a large bowl, combine the dry ingredients – flour, salt, sugar, baking powder and baking soda, cinnamon and nutmeg. In another bowl beat together the eggs, oil, vanilla extract and zucchini. Add the wet ingredients to the dry mixture and mix gently. Fold in the blueberries. Divide evenly among the muffin cups. Bake for 16-19 minutes or until a tester comes out clean. Transfer to a wire rack to cool completely. Enjoy! I change the measurement to 1/2 cup sugar and add 1/2 of maple syrup . The muffins are so moist…love it! 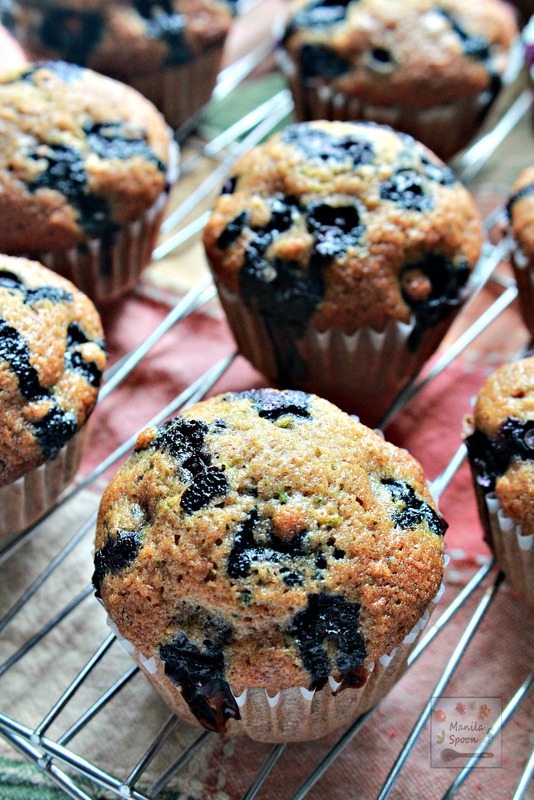 Best recipe ever with combination of blueberries and zucchini! I am so glad you enjoyed these muffins! Have to try it with maple syrup too! Thanks for the tip!